If I’m in Yosemite, it means it’s the end of May, and school’s out for summer (sing it with me!). This year it also means I’ve completed my 21st year as a full-time writing professor… and before Sacramento City College hired me to teach journalism and English, I’d never spent more than four years in the same gig. That’s what journalists do—move from job to job, city to city, war-torn country to war-torn country. Only I didn’t cover wars or big time stories. I was pretty much a small-potatoes reporter on a few newspapers, one now-defunct wire service and a magazine. I love journalism; my heart rate picks up when I’m around presses churning out copies of fresh newsprint. But it is, as an old newspaperman told me when I was in my 20s, a young person’s job. At some point you don’t want to cover another city council meeting or legislative hearing or try to find a new kind of feature story at the State Fair. You’re done. I was fortunate to find my way into teaching when I was in high school—at Roseville High School pool, to be specific, up to my chest in chlorine’d water, coaxing scared little kids off the side and encouraging them to float on their backs (a very scary prospect) or (even scarier) blow bubbles, face down, and kick and stroke like mad in something that resembled swimming. I also got to coach synchronized swimmers, having been one myself. A decade later, a former college professor of mine handed me a journalism class to teach—filling in for a professor who had to leave five weeks into the semester because of a death in his family—and I found a second profession I loved. That was 1985, and I’ve been hooked on teaching writing to college students ever since. I knew that my primary job was—as with the little kids learning to swim—convince people that all they had to do was let go and trust that they could do this. (And maybe know where to place a thesis statement or a lead and oh, I don’t know, some commas maybe.) Lucky me, I got the full-time job in 1993; I have colleagues who have been part-timers forever, flying from classroom to classroom trying to cobble together a living. They work harder than I do for far less money. Still, as people are wont to do, I moan and groan my way through the school years, generally loving my job but finding some weeks downright demoralizing (don’t we all?). Sixty-hour weeks’ll do that to ya. But unlike a lot of people I know, I get these amazing breaks in the form of a couple of months off here, a month off there, and that makes all the difference. For some years now my dear fella has taken me—practically moments after I walk with my fellow faculty members into the stadium for another graduation—to Yosemite, which this year celebrates its 150th anniversary. On June 30, 1864, while occupied with the Civil War, President Abraham Lincoln signed the Yosemite Grant Act, “establishing Yosemite Valley and Mariposa Grove as the first protected wild land for all time,” according to the National Park Service website. 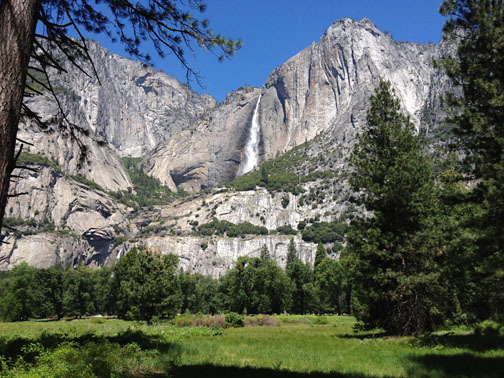 In 1890 land surrounding these two tracts was declared a national park, and in 1906, thanks to the efforts of John Muir and President Theodore Roosevelt, it all became Yosemite National Park. You cannot be here on a late spring evening, in the middle of a great meadow, as we were tonight, looking up at the cathedral of rock walls surrounding you, and not be grateful to those people—or the ones who carry on the work of protecting this place today. We feel so lucky to spend time in Yosemite Valley, looking up at Yosemite Falls in one direction, to Half Dome in another, feeling the peace of it all. Even in a national park where thousands congregate, at the end of each day it gets very quiet here. You can roll out your yoga mat in Leidig Meadow, as I did this evening, not far from a young buck munching tufts of grass, and put your body into mountain pose and tree pose, do a little sun salutation as it sets behind the towering wall of granite. And be grateful, so grateful, for this lucky, lucky life of mine. Congratulations on 21 years of “professional” teaching – whatever THAT means! Does that make you a “legal – adult” teacher? Though I taught for 30 years, I’m still working on that “adult” thing. Maybe when I’m as old as Yosemite, I’ll reach that distinction! Thank you for more insight into your story and thoughts on journalism. I’m so glad you have a place like Yosemite to let go, breathe and rejuvenate! Yoga in the meadow and Peace in the Valley sounds pretty perfect!